Posted by Trixie. May 1st 2016. 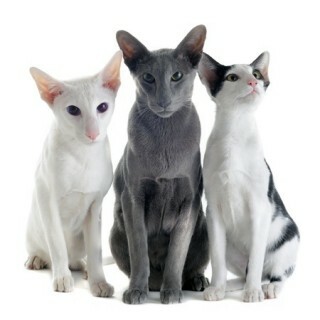 Oriental cats belong to the Siamese breed and, in fact, are almost identical to their cousins except for the colouring. These medium-size cats are slender and muscular and both longhair and shorthair varieties exist. The fur appears in a vastly diverse range of colours and patterns. Oriental cats are athletic, intelligent and highly sociable. The Oriental is a man-made breed originating in 1950s Britain. After the Second World War, breeders became more creative and many modern breeds, including Orientals, originated during this period. Russian Blues, British Shorthairs, Abyssinians, and regular domestic cats were crossed to Siamese. The resulting cats were non-pointed and were crossed back with Siamese. The non-pointed cats are the ancestors of modern Orientals. Initially, each colour was developed and named as an individual breed until it became clear the diversity was too vast and the colours were grouped into the Oriental shorthair and Oriental longhair. Orientals were imported into the US in the 1970s and accepted by the Cat Fanciers’ Association in 1977. 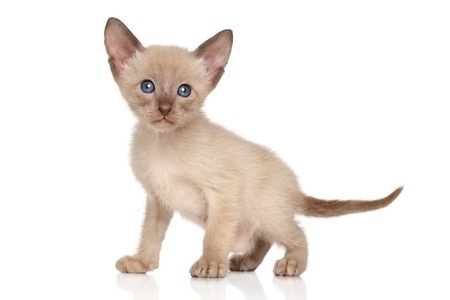 Adult Oriental cats grow to be between 5lb and 10lb. The tube-like body is supported by long, wiry legs, with the hind higher than the front. The tail is long and thin and tapers to a point. The head is wedge-shaped, with almond-shaped eyes and large ears that have a rounded triangular tip. The shorthaired variety has a smooth, sleek coat, while the longhair has medium-length fur draping from its elegant body. While the bodies are svelte, Orientals are surprisingly sturdy, with good muscle tone giving them a deceptive weight. There are an estimated 600 varieties of colour, pattern and coat lengths within the breed. The temperament of Oriental cats is very similar to that of Siamese. They are intelligent, curious and love being around people and other cats. They enjoy games and challenges and will play fetch, returning a toy to its owner tirelessly. Their love of play is maintained as they grow, giving adults a similar nature to Oriental kittens throughout their lives. They love being around people and relish companionship, meaning they don’t appreciate being left alone for long periods. If you are likely to be out at work during the day, consider pairing two Orientals together to keep each other company. Orientals will try plenty of tricks to get your attention – a nudge while you are reading or a gentle brush against your leg as you eat at the dinner table. Orientals cats are good with children, other cats, dogs and thrive in busy, bustling households. They will likely develop a fondness for a particular toy or game. It’s a good idea to provide plenty of entertainment, otherwise they will make their own – which could leave you with a clear-up job when you return. Shorthaired Oriental cats require minimal grooming. A brush with a fine comb or soft-bristle brush will help remove dead hair and keep the coat looking shiny. The longhaired variety will need more frequent brushing to prevent and get rid of knots and tangles. Brush the teeth at least once a week with cat-friendly toothpaste and use a damp cloth to remove any discharge from near the eyes. Be sure to use a different cloth for each eye to avoid spreading infections. Trim the nails as needed, usually every couple of weeks and clean the ears with a cotton wool ball or soft tissue. Like all cats, Orientals appreciate a clean litter tray. Orientals should be regarded as an indoor-only cat. The breed needs regular vaccination boosters against common cat problems such as influenza and enteritis. Your vet or breeder will be able to advise on the details of vaccination. A good-quality cat food will suffice, with occasional treats such as chicken or fish. Tina Mullineaux, a Siamese and Oriental cat breeder, says: “I choose to feed a premium, high quality dry food with a helping of high-quality wet food each day. “Their diet is also supplemented with whatever meat we happen to be eating for tea that night. Orientals are generally healthy but share the same issues that affect the Siamese breed. These include bladder stones and liver failure, heart problems and an inherited neurological affect that causes crossed eyes. They have also been known to develop a condition that causes excessive self-grooming that can lead to hair-loss. The life expectancy of Oriental cats is 10 to 15 years.